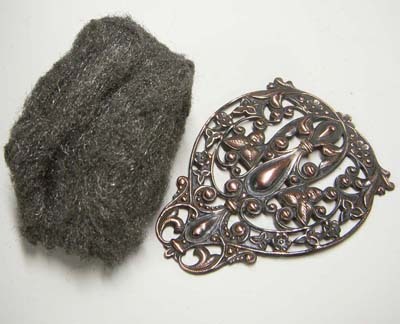 This is rb02826 from the B'sue Boutiques website, in rusty black patina finish. Don't go too hard on it, but just til you see that underlayer show up. If you want, you can re-seal with Renaissance Wax, but you probably wouldn't have to. Then, at the WIDE end, in the middle of the wide end, drill or punch a hole to attach a large 10mm jump for attachment. 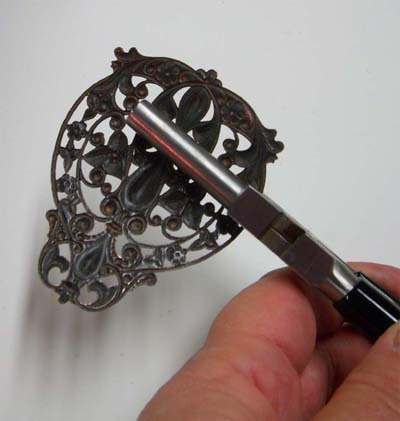 Easiest to do it before you bend the filigree! 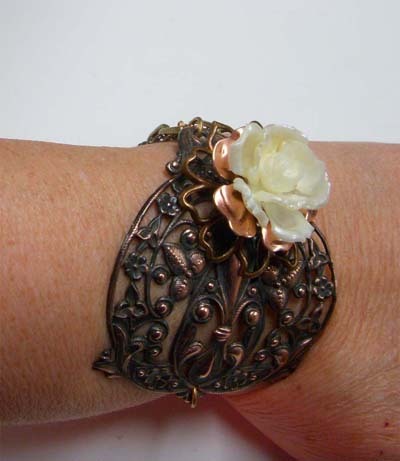 When you get it to where it lays perfectly on your wrist, it's time to layer the flower and wire it on. Stack your flowers and take a piece of wire 4-5 inches long and loop the end. 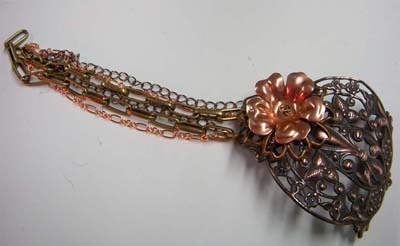 Pierce the flowers with the wire, letting the loop anchor them together. 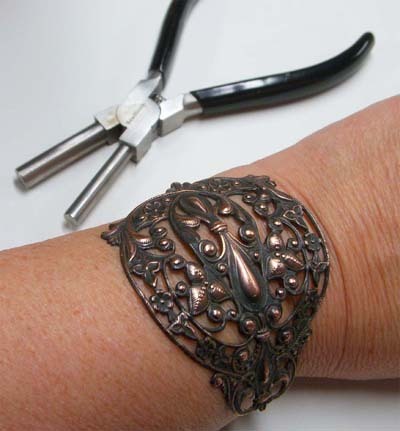 Then, birght the wire through the filigree and wrap back up through as tight as you can get it. See how the chains fit? I wire-wrapped some little rusty black filigree beads and a vintage topaz-colored 8mm Czech bead, and hung them the back loop for just a little extra visual interest. I hope you will give this project a try! 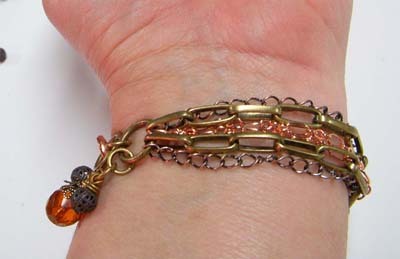 The result is a showy bracelet, and it takes just a little time. 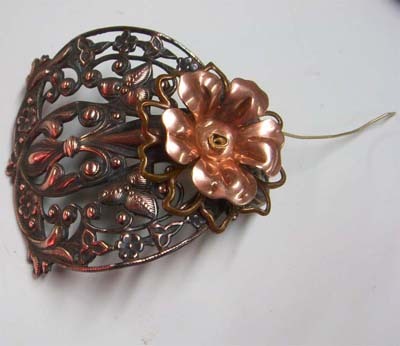 We carry the big filigree in Russian Goldplate, Brass Ox, Old Rose Ox, Silverware Silverplate and Raw Brass....so you can go with any color type you'd like. I love mixing metal colors! It gives you so many options. Brenda Sue Lansdowne is the owner of B'sue Boutiques, the writer of the blog "Jewelry Making Outside the Box" and many You Tube instructional videos. She writes a weekly newsletter that you can sign up for on the home page of this website, and moderates a discussion group on the B'sue Boutiques Facebook Fan Page. Read B'sue's About Me, accessible from the top toolbar of this website (on the home page) to get the whole story. 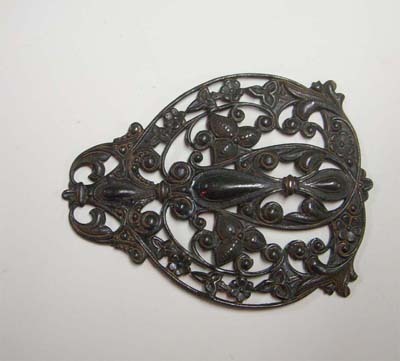 B'sue began as an antiques dealer/picker who eventually specialized in vintage costume jewelry. 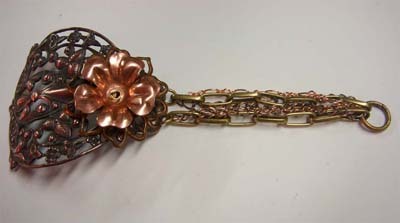 In time, she decided to make her own large line which was sold to over 500 boutiques and gift shops across the country. 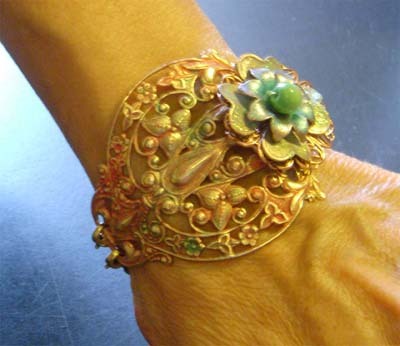 In 1997 she began selling jewelry making supplies online. B'sue has 23 years experience in the business, and loves to share projects and techniques with you.